The opening par 4 offers a great chance to get off to a good start with a well placed drive. Three fairway bunkers guard both sides of this visually challenging tee shot. A tee shot that favors the left side of the fairway will give you the best chance at a makeable birdie opportunity. The second, is the first of three difficult par 3s on the front nine. The difficulty of this hole will be club selection. The tree lined left side doesn't allow you to feel the wind swirl off the water. A large bunker guards the right side of the green and will catch a majority of a player’s bail out shots. This long par 4 typically plays into the prevailing wind. This will leave most players with a mid or long iron into a challenging elevated green. Be aware of the large bunker in front of the green; as well as runoffs left and long to avoid a very difficult up and down. Club selection is imperative on the challenging mid-length 4th. This multi-tiered green will test your ability to control your ball flight early in the round. Hitting a well controlled iron shot onto the proper tier will leave you with a great opportunity at birdie. The lengthy 5th generally plays as a three-shot hole, although a daring right to left drive can leave you in position to attack this sloping green. Be sure to control your spin into this green as your ball can easily get away from you by catching the large false front on the left side of the green. The short 6th makes for a great birdie opportunity. Depending on wind this drivable par 4 with water right and a large bunkers left will make you evaluate your miss. Being on the correct side of the hole will make for a straightforward up and down. The long par 5, 7th has three large fairway bunkers framing the wide fairway. A water hazard on the left side of the hole will demand a solid second shot; putting you in position to hit a short third. A large, deep greenside bunker along with runoffs surrounding the green will force you to control your spin and accuracy while hitting into this elevated green. Do not let the yardage fool you on the short 8th. Choosing the correct club is extremely important, as this is one of windiest sections of the entire course. A poorly struck shot can make for a difficult up and down on this severely undulated green. The long ninth is one of the most challenging holes on the course. Be sure to control your ball flight off the tee, as the right side of the fairway leads balls directly into a large fairway bunker that will make reaching this green in regulation very difficult. Two large, deep fairway bunkers sit on the left side of this mid-length par 4. Positioning a drive down the right center of the fairway will leave you a mid to short iron into this severely sloped green. Distance control is imperative with a back to front sloping green and deep bunker protecting right hole positions. The difficult 11th requires a precise drive in-between the water on the left and the large bunkers protecting either side of this narrowing fairway. A drive up the right side will give you the best angle to attack any hole location on this narrow green complex. The par 3s at Floridian are distinctive and difficult, the 12th hole is no exception. This large green complex is protected by a false front, two large bunkers, and a water hazard wrapping around the entire left side. Putting from below the hole is extremely important on this back to front sloping green. The short 13th is one of the best opportunities you will have to reach a par 5 in two shots at Floridian. This tee shot calls for a ball working right to left off the massive fairway bunkers that guard the right side of this wide fairway. Runoffs surrounding the green will invite the player to hit a high, soft shot into this large elevated green. The long 14th is one of the most challenging driving holes at Floridian. Water to the right and deep bunkers to the left will visually intimidate any golfer. A tee ball hugging the left bunkers will give you the best chance of holding this left to right sloping fairway. The 15th is the final of the four par 5s at Floridian. Water right and a large, deep cross bunker will put a premium on a well controlled tee shot. Driver is not required here due to a fairway sloping towards the hidden water hazard that meanders down the entire right side of the hole. Bold players will challenge the narrow green in two with trouble looming on all sides of the hole. Last but not least, #16 is the final par 3 on the golf course. A multi-tiered green that measures 55 yards from front to back asks the player to hit anything from a short iron to a fairway metal. Hitting your tee shot on the correct tier gives you the best chance at birdie. The picturesque 17th is a phenomenal risk reward hole. The player will be forced to carry the marsh to reach the fairway. This short par 4’s green can be reachable for the longer hitters, however players are typically left with a dicey short wedge into a prevailing headwind. Beware of the false front that lurks behind the deceiving mid range bunkers. 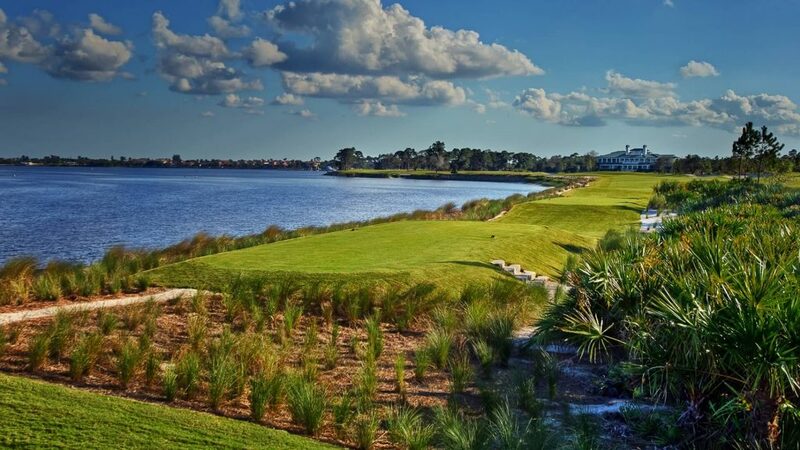 The 18th demands a well-struck drive to navigate the bunker on the right and the St. Lucie River to the left. Players will be left with a long approach shot guarded by water that wraps around the green into the marina. The difficult 18th is a suitable finishing hole as it will surely test the skills of this year’s Crane Cup Champion.